Washington Post photos There’s plenty of debate when it comes to chili – beans or no beans, etc. – but at the end of the day, it’s all good. 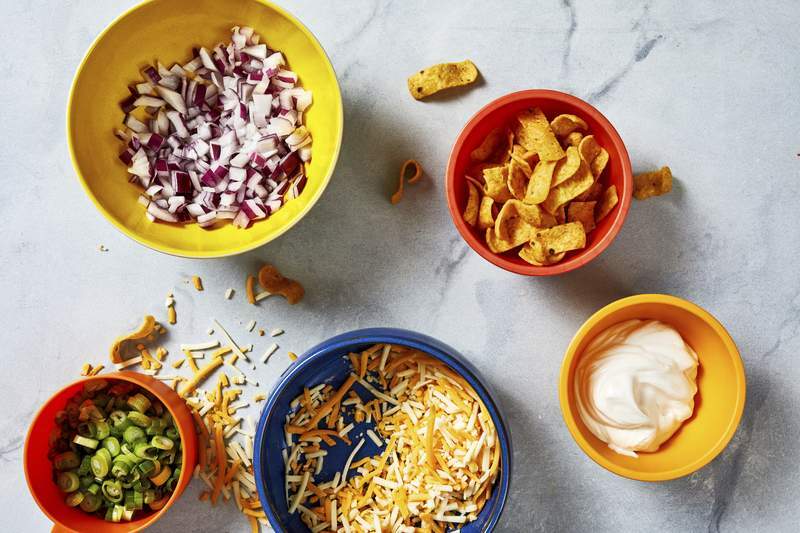 Once your chili is complete, you can get really creative with an assortment of garnishes. A pot of chili may be one of winter's ultimate comforts. Hearty, filling, hot and well suited for a long cook time on your stove top, filling your kitchen with warmth and enticing aromas. 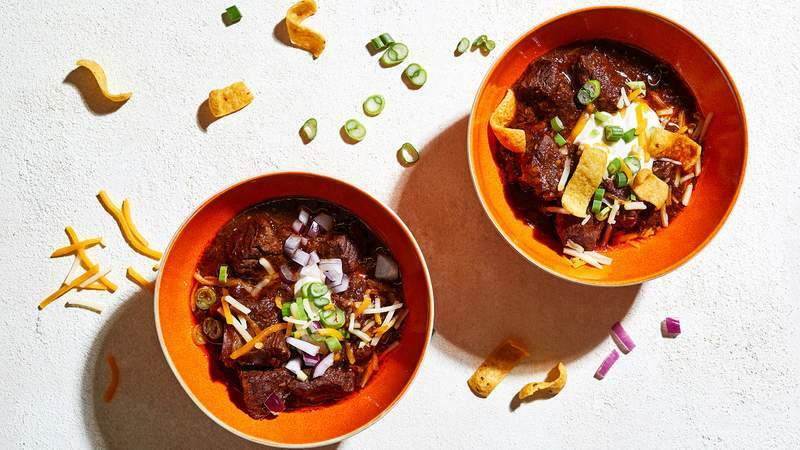 “I think it is pretty flexible and up to the individual,” says Dan Farber, chef de cuisine at the Washington, D.C., location of Texas-inspired Hill Country, home to an annual chili cook-off. That's not to say there aren't strong opinions, particularly when it comes to regional specialties (Texas, New Mexico, etc. ), beans and vegetarian versions. Think about the chile peppers, and the chili powder. Despite the many iterations, the one unifying thread among everything calling itself chili is the chili powder, Walsh says. (According to Post style, the whole peppers are chiles, the spice blend and dish are chili.) The chili powder “is the backbone” of chili, so that's the first thing to figure out, he says. You can certainly buy chili powders, but what's in the blends is often not disclosed. If you prefer to have more control, start with your choice of ground chiles, or grind them yourself, and combine them with other typical spices, such as cumin, oregano and garlic or onion powder. Toast the spices first for extra oomph. Among the types of chiles to consider: Ancho, pasilla, chipotle and New Mexican long red. If you want even more deep pepper flavor, you can reconstitute and puree dried chiles to incorporate into the chili, even using some of the soaking liquid for additional taste and color. Consider other additional flavors and ingredients. Farber suggests coriander as a complementary spice, as well as smoked paprika (itself a ground pepper). He also likes to incorporate tomato paste, which briefly cooks in the pot after any aromatics have been sautéed in the fat left over from searing the meat. He deglazes (gets up those tasty brown bits) with beer, too. Other possible liquid additions include a little coffee, beef broth and dry red wine. Even chocolate can provide a savory depth that tasters won't necessarily be able to identify. Tomatoes – a can of Rotel or just some plain Italian plum tomatoes – can work, too, though Walsh points out that some purists say that's just making spaghetti sauce. “I tend to err on the light side, on not too much tomato, because you don't want the tomato to take over,” he advises. Pick your meat – or don't. Traditional Texas chili, a “bowl of red,” is made with beef. End of story. At El Real Tex-Mex Cafe, the Houston restaurant that Walsh co-owns, the chili features cubed beef chuck. Texas grocery stores even sell a “chili grind” of beef, which is coarse. But for the rest of us, ordinary ground beef is fine, too. It just depends on the texture you're going for. Walsh does, however, recommend against more tender – and expensive – cuts of beef (say, tenderloin) which will get too mushy after a long cook time. Walsh thinks game-based chili is “fantastic,” so if venison or bison suit you, go for it. Lamb and ground turkey are popular, too, and Walsh's book features recipes with pot roast from James Beard and short ribs from Tyler Florence. Pork and chicken? Yes, the latter of which is especially nice in a chili featuring green chiles. “Use what you have or what inspires you,” Walsh writes in his book's introduction. Most of the time you're going to want to brown your meat in the pot first for better flavor and texture. Do it in batches so as not to overcrowd the pot. If a lot of fat is rendered, you don't have to use all of it, but some makes for an ideal base for sautéing your aromatics. As for meatless chili, Walsh writes, “While much is made about the debate over beans versus no beans, that's a minor squabble among close friends compared to the vicious dispute over meat versus no meat.” (More on beans below.) That being said, make your chili however you want! Walsh developed recipes with seitan, tempeh and tofu that serve as sort of meat substitutes, but you can also skip those and just go heavy on the beans. Vegetables such as zucchini and sweet potatoes work well in vegetarian versions. Add beans – or don't. Yes, people have strong feelings about beans. But in the grand scheme of things, is it really worth it to get all worked up about beans in chili? I don't think so. So if you want beans, add them and don't apologize. For cooked or canned beans especially, it's best to add them in the last 20 to 30 minutes of cooking so they don't disintegrate, Walsh says. If you have the time, though, he recommends looking into starting with dried beans, which gives you a flavorful broth to work with and more interesting heirloom varieties to try. Cook it low and slow. “It's a long, slow cook,” Walsh says. “Within reason, the longer, the better.” That type of cooking tenderizes meat, melds flavors and ideally creates a luxurious texture. Farber recommends tasting a bit along the way, adding more salt and pepper as needed. If you're cooking uncovered, check the pot occasionally to make sure things aren't looking too dry. Low heat will prevent the food from scorching. Knowing when chili is done can be a little tricky. “It's not like a steak where you've got a thermometer in it,” Walsh says. So taste it and look at it. Is the meat tender? Are you happy in general with the flavor? How's the consistency? “Is it coming together or does it look like ground beef soup?” Walsh says. If you're happy with it otherwise, a slurry with flour or masa harina (dried corn dough ground to a flour) can help. Combine the thickener with a bit of the liquid from the chili and then add it back to the pot. You should start to get some thickening as it cooks more and then after the chili comes off the heat and cools. Garnish to your heart's content. Farber thinks the garnishes are really where home cooks can go wild with chili. His favorite toppers are red onion, cheddar cheese and sour cream. But that's just a start. Of course, if you'd never cook chili with the beans in it, you can serve them as a topping or side. Put out tortilla chips or Fritos for crunch. Sliced or chopped serrano and jalapeño peppers can add heat, as can hot sauce. Lettuce, scallions and cilantro bring a fresh, green vibe. Or provide tortillas for filling.